Bus from Kuala Lumpur to Kota Tinggi is the most preferred mean of transportation for the residents in Kota Tinggi. flight and train service in Kuala Lumpur do not serve to Kota Tinggi. Therefore, direct bus service becomes the only transport option for working adults and students in Kuala Lumpur to go back to their hometown, Kota Tinggi. For those who love the sun, blue sea, white sand and the clear sky, they can go to Desaru Beach by taking about 1-hour taxi ride from Terminal Tun Sri Lanang Kota Tinggi. Transnasional and Mayang Sari Express are two well-known bus operators serving bus from Kuala Lumpur to Kota Tinggi. Transnasional is the dominant player between them by providing 6 daily departures. Mayang Sari only provides 1 daily trip to Kota Tinggi at 6pm. The first bus starts as early as 8.30am while the last bus leaves TBS to Terminal Tun Sri Lanang Kota Tinggi at 11.30pm. Both players are serving the bus route with VIP coach which has spacious seat. Passengers could have a good rest during the journey to Kota Tinggi from Kuala Lumpur. Duration for bus from Kuala Lumpur to Kota Tinggi takes at least 4 hours depending on traffic and weather condition on the day of departure. The bus fare from Kuala Lumpur to Kota Tinggi is reasonably charged at about RM 35.00 for adult and RM 26.80 for child. One break at highway resting area will be given during the journey. 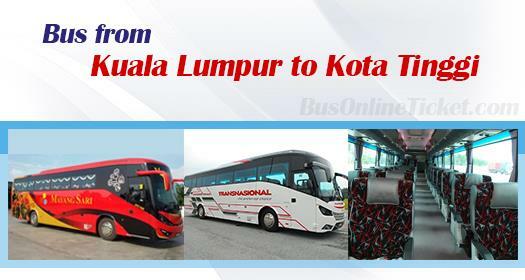 Booking Kuala Lumpur to Kota Tinggi bus ticket with BusOnlineTicket.com is secure and convenient. Visit BusOnlineTicket.com now and purchase your bus ticket through online in anytime, anywhere, and anyplace without waiting in a long queue. Online booking gives you peace of mind that you have your transport secured before you travel.